RuntasticThis is what a good night’s sleep looks like. For the past week, I’ve been tracking my sleep. I didn’t use an expensive wearable device, nor was I attached to fancy medical equipment to help me track how efficiently I was catching those Zs. I used Runtastic’s cool Sleep Better app, which is available now for both iOS and Android. The app has a beautiful design that makes it simple to see all sorts of stuff about your sleeping habits. You can tell the app whether you worked out, had a stressful day, aren’t sleeping in your own bed, ate a late meal, or drank caffeine or alcohol. When you wake up, you enter how you’re feeling and whether your dreams were good, bad, or neutral, using little icons that represent each item. You can also enter notes about the dreams you had. Over time, you can see how those factors play into your sleep efficiency. It even tracks moon phases, so you can see if that influences how you sleep. The app integrates with Apple Health, as well as with Runtastic’s other apps. Sleep Better doesn’t use a wearable device to track your sleep; you just place the phone next to your pillow and press “Start” to get it to start tracking your sleep. But just like a device you wear on your wrist, it relies on body movements to tell how deeply you’re sleeping. Runtastic figured out that if you don’t move for around 15 minutes, it’s safe to assume that you’re in a deep sleep phase. ScreenshotI definitely was not in a deep sleep for 4 minutes. Perhaps the coolest part about Sleep Better, however, is what Runtastic calls a “Smart Alarm.” You give Runtastic a window for when you’d like to wake up, say between 5:30 and 6 a.m., and the app will figure out the ideal time to wake you up, based on whether you’re in a “light” or “deep” sleep phase. According to Runtastic’s research, the best time to wake up with an alarm is when you’re in a “light” sleep phase. If you’re in a “deep” sleep phase, you may experience more fatigue. Overall, the app was super easy to use. It was fun checking out my sleep efficiency (between 91% and 96% on average), and I really felt less fatigued using the “Smart Alarm” feature. I also found the app to be accurate, for the most part. One night I hit “Start,” only to decide a few minutes later that I wasn’t actually ready to go to bed. The app tracked this as me sleeping for 10 minutes. In fact, it said that I had been in a deep sleep for 4 minutes. There are many benefits to getting a good night’s rest, not least of which feeling refreshed and energized in the morning. By tracking not just your sleep but also the factors that may contribute to a good night’s rest, you have a better chance of maintaining a healthy lifestyle. There are a ton of sleep-tracking apps in the various app stores. 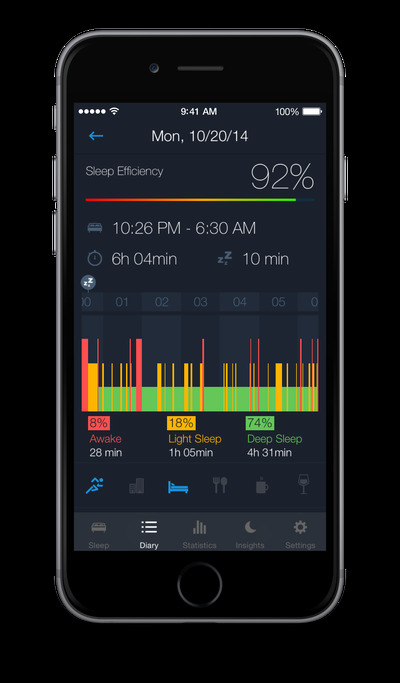 But the beauty of Sleep Better is its integration with Runtastic’s other apps — as well as Apple Health — to give you a full picture of your health. “If we’ve learned anything in recent years, it’s the importance of a balanced, 24-hour approach to overall health and fitness,” Florian Gschwandtner, Runtastic cofounder and CEO, said in a statement. 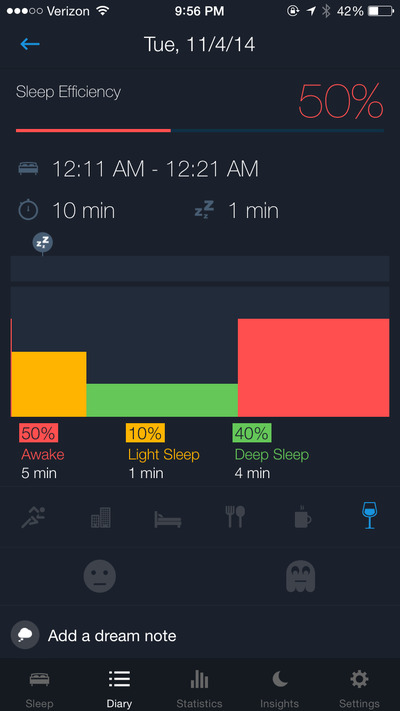 Sleep Better app is a simple way to track sleeping habits. I’ve never been a good sleeper. It sometimes takes me a while to get to sleep, or I wake up throughout the night. In just a week, I found that eating a late meal not only made me sleep less efficiently, but also gave me weird dreams. I also tend to wake up in a worse mood the day after I eat late. Over time, I could try tweaking these habits to see if it affects my sleep efficiency. Intuitive tracking, coupled with the Smart Alarm, make the Sleep Better app a great way to figure out your sleeping habits.